The Pulpit. Fort Fisher, North Carolina. 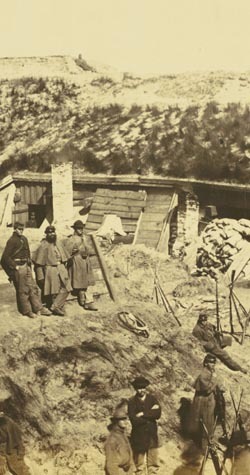 Upon the failure of the attack of December 24th, 1864, on Fort Fisher, near Wilmington, a second military force was detailed, composed of about eight thousands five hundred men, under the command of Major General A. H. Terry. This officer arrived off Fort Fisher on the 13th of January. Offensive operations were at once resumed by the naval force, and the troops were landed and intrenched themselves, while a portion of the fleet bombarded the works. These operations were continued throughout the 14th with an increased number of vessels. The 15th was the day decided upon for an assault. During the forenoon of that day forty-four vessels poured an incessant fire into the rebel forts. There was, besides, a force of fourteen vessels in reserve. At 3 P.M. the signal for the assault was made. Desperate fighting ensued, traverse after traverse was taken, and by 10 P.M. the works were all carried, and the flag of the Union floated over them. Fourteen hundred sailors and marines were landed, and participated in the direct assault. Seventy-five guns, many of them superb rifle pieces, and nineteen hundred prisoners, were the immediate fruits and trophies of the victory ; but the chief value and ultimate benefit of this grand achievement consisted in closing the main gate through which the insurgents had received supplies from abroad, and sent their own products to foreign markets in exchange. Light draught steamers were immediately pushed over the bar and into the river, the channel of which was speedily buoyed, and the removal of torpedoes forthwith commenced. The revels witnessing the fall of Fort Fisher, at once evacuated and blew up Fort Caswell, destroyed Bald Head Fort and Fort Shaw, and abandoned Fort Campbell. Within twenty-four hours after the fall of Fort Fisher, the main defense of Cape Fear river, the entire chain of formidable works in the vicinity, shared its fate, placing in our possession one hundred and sixty-eight guns of heavy caliber. The Pulpit, Fort Fisher, North Carolina. January, 1865. Albumen print photograph by Timothy O'Sullivan.